The central philosophy of traditional Chinese medicine is "prevention." As quoted in the first chapter "Nature's Theory'' of the ancient classic book Huang-Di Internal Medicine (2500 BC), "the best medical practice is treating the patient before he gets sick." This is similar to the western cliche "an ounce of prevention is worth a pound of cure." Nowhere is this philosophy more evident than in the preventive measures used by wisemen in ancient China to combat decrepitude and the process of aging. Aging is natural, inexorable phenomenon. However, by following the ancient Chinese medical practice of reinforcing the body's resistance, one can certainly delay the speed is not the process of aging. Modern medical statistics show that the body's functions start declining at the age of 40. The brain and kidney are no longer at their prime stage, gray hair and hair loss appear, entero-stomach mucous membrane begin atrophy, digestive and metabolic systems including enzyme and protein synthesis decrease in production while endocrine deficiencies cause hormonal and immunological imbalance. These malfunctions result in the symptoms of fatigue, frequent colds, increased frequency and dribbling of micturition, spontaneous perspiration, dyspnea, menstruation irregularities, and loss of sexual potency. These can be classified as "Pre-age senility." Through centuries of clinical experiments and observations, a number of Chinese herbal mixtures have been used by the emperors for the purpose of strengthening the body's resistance and dispelling the invasion of harmful factors. Thus, prolonging life and benefiting longevity. Unfortunately, such ancient prescriptions have not been appreciated in the western world due to cultural differences. "Hui-Chun" in Chinese means "return to youth." It is the one anti-aging formula that stands up among the ancient aging prescriptions. Hui-Chun works in accordance with the ancient principle of Yin and Yang. Interestingly, this philosophy resembles the concept of homeostasis, the natural balance that occurs within the body, including the harmony between reenforcing and reducing which regulates many vital organ functions. Thus Hui-Chun can facilitate the body's own restorative and regenerative abilities. In order to enjoy healthy lives, we must feel balance with nature and within ourselves. Natural Pharmacia International is striving to help people attain this balance through promotion of preventive health care products such as Hui-Chun. Hui-Chun is a powderous mixture of Hippocampus, Ganoderma lucidem, Polygonum Multiflorum, Concha Ostrae, and several other natural products. These expensive herbal ingredients were traditionally known in China for their effects on longevity. To assure its safety, and efficacy, "Hui-Chun" was reexamined in 486 elderly cases and followed up for five years (1982-1987) study in China. "Hui-Chun" is different from general tonics such as ginseng preparations, which can cause dryness and stringency if administered daily. The ingredients selected can exert a two-way regulatory function by either "reinforcing" or "reducing" accordingly. The active components in Hui-Chun can normalize the functions of internal organs. It contains essential rare elements as evidenced from chemical analysis, such as Zn, Mg, Ge, and high content of Ca (34,000 ppm). Harmful elements such as lad and mercury were not found. More importantly, these elements exist in a natural form and are readily absorbed by the body. Daily supplements of these essential rare elements are also highly recommended by modern physicians. For instance, Dr. Hans Kugler, author of the best-selling book, Slowing Down the Aging Process and editor of the clinical journal Preventive Medicine Update stated, "research clearly indicates that prescription drugs are not nearly as effective in treating chronic disease, such as prostate disorders, as is the process of correcting the organs' nutritional deficiencies which increase in age." The world-famous founder of the free radical theory of aging, Dr. Denham Harman at the University Of Nebraska School Of Medicine stated, "some 90 percent of the population consumes diets deficient in zinc," The prostate uses ten times more zinc than any other organ in the body. Many scientists have confirmed that when sufficient zinc is present, it helps prevent the enlargement of the prostate. It is amazing that the ancient Chinese have long recognized the importance of these rare elements including zinc to human health and the aging process. The blood circulation can be improved within three months of administration. This is supported by monitoring the levels of high density and low density lipo-proteins in the blood. It also increases the blood quantity and circulation of the myocardium. It has both stimulating and relaxing actions on the brain. It improves the symptoms of weakness of the legs and knees of people with pre-aged senility. It also showed good improvements among people with osteoporosis or neurosthenia. This is in agreement with the high content of calcium (34,000 ppm) found in Hui-Chun. It has a two-way regulatory function on the body's immune system. Reinforcing the body's immune strength results in less frequency of contracting colds. Normalizing the body's immune function can also reduce allergic symptoms in people suffering from sensitive immune systems. As the result of overall improvements of the body's blood circulating, hair regrowth for certain types of baldness, and reduction of liver spots among the elderly were often observed. Its effects on the endocrine system provide the balance of Ying and Yang within the body. For men, sexual potency and sperm production are elevated. For women, increased vaginal mucus secretion are noticed -- especially among women who have already experienced menopause. Through its regulatory effects on the body's metabolic system, excessive body fast will be metabolized in a faster rate. A long term administration (six months) can result in a stronger with a much improved muscle to fat ratio. Natural Pharmacia International (NPl) is a high-tech based natural products laboratory. Founded by Dr. Y-W Lee and a group of prominent scientists in the United Sates, NPI is dedicated to the promotion of preventive health care products derived from traditional Chinese herbal medicines with proven scientific evidence. 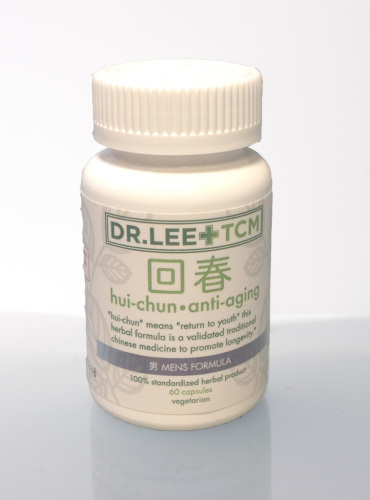 Hui-Chun represents a carefully selected group of preventive natural products used as a daily nutritional supplement. It is highly recommended for men and women over the age of 40. Its safety, efficacy, and quality are guaranteed and its production is in compliance with GMP standards. Formulated Exclusively For: Natural Pharmacia International Inc.